What Do You Want to Know About the 2018 Fiat 124 Spider Abarth? Miata, Miata, Miata. It feels like that’s all anyone ever talks about, because it can be hard not to. 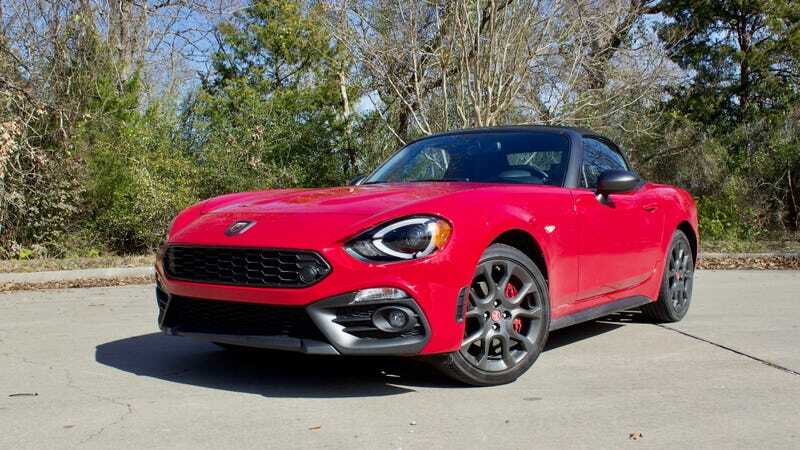 But there are other small, fun roadsters on the market, like the 2018 Fiat 124 Spider Abarth. So what if it’s based on the Miata? I have one this week. What do you want to know about it? The 124 shares the platform with the current ND Miata, but one of the big differences between the two is the engine. This one has a 1.4-liter Fiat Chrysler-sourced turbocharged inline-four, while the Miata has a 2.0-liter one without a turbo. They may have similar bones, but they’re pretty different in character and execution. This 124, with its Abarth branding and Recaro seats, has an MSRP of $35,765. So far, this thing is incredibly fun. It’s got a unique, crackling exhaust note to go along with its six-speed manual transmission, and it handles well. About half of the interior matches that of the current Miata, and shifting is just as smooth. Ask and I shall answer, in the review.